This week, Portland Mayor Tom Potter is in Washington DC, for the Mayors Innovation Project. High on the agenda will be climate change, energy conservation and how to build an economy that creates green jobs, including living wage jobs for people of color and low-income people. Here in Portland, job opportunities already are growing. That's because key city leaders and minority advocates are taking crucial steps to make sure that Portland is on the cutting edge of the green economy. 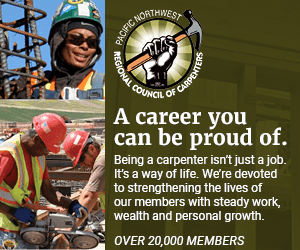 "It's a new phenomenon, and we need to take advantage of it," said Fay Burch, consultant, entrepreneur and board member of the Oregon branch of the National Association of Minority Contractors. "It would be nice to see people of color learning more about and taking ownership of green technologies because there are all kinds of opportunities in this field: from business consultancy to owning your own business to jobs with nonprofits." According to a report by the Bay-area nonprofits the Apollo Alliance and Urban Habitat cities and states can build green economic opportunities by investing in renewable energy sources, energy efficient buildings and training a green workforce. Connect communities with efficient transportation systems. By these standards Portland is way ahead of the curve – well placed to attract green projects and business. The challenge will be to make sure people of color and low-income Portlanders are included in the new green workforce. Take transportation. In TriMet, the city has one of the strongest city transportation systems in the country. The agency, which has managed huge construction efforts like the Interstate and Westside light rail projects, also leads the field in the diversity of its workforce. That's because TriMet chief, Fred Hansen believes you can't have sustainability without social equity. Sustainability is about using rerefined oil and biodiesel instead of gasoline, or recycling road asphalt as the road bed under the light rail, Hansen said. But it also is about removing barriers for minorities and hiring a diverse local workforce. "If we do not have social equity then it isn't sustainable," Hansen says. "And let me stress this is not with one iota lower quality of work. In fact we have had excellent work from our minority contractors." To remove barriers for minorities, TriMet worked with its prime contractor to break down large contracts, and offered technical assistance to small contractors. In the process TriMet has helped those firms expand in expertise and size. "We have seen these same firms grow from where their biggest contract was $30,000 or $50,000 to now doing half a million dollars a year," Hansen said. Turning to city agencies, the Portland Development Commission has diversified its board, and its lending efforts. PDC also now offers certification classes in green building construction. Fifteen people from the Association of Minority Contractors have been attending the classes ans studying to pass the highest level of the LEED (green building) certification test, Fay Burch told The Skanner. The association offers a weekly information session for its members on LEED certification. "PDC alerted us early on so we could get registered," she said. "I think it (training in sustainable practices) is something that we need to do for ourselves, especially here in Oregon. "Whether you are in waste management, paving, trucking, plumbing, there are ways that this issue can apply to your business. A lot of our members actually need to do this to remain relevant." At the City of Portland's purchasing department, director Jeffrey Baer helps minority and small businesses land city contracts through the sheltered market program, which allows state-certified disadvantagd, minority, women –owned and small businesses to compete amongst themselves for city contracts between $5000 and $200,000. Now those contracts are looking for environmentally friendly products and services. "We are greening where we spend our dollars," Baer said. "So, when we buy paper, for example, we are buying 100 per cent chlorine-free paper." To help contractors moving to more sustainable working practices, the city is offering classes and technical advice on sustainability. "We tell them what green building is and how to do it," said Alisa Kane, from the Office of Sustainable Development. "We talk to thousands of people a year about how to incorporate green standards into their business practices." Other city classes target homeowners. In fact, consulting with businesses and homeowners on energy efficiency and sustainability is a growing career field. Portland Community College and Mt. Hood Community College both offer classes that help prepare construction professionals to work on green buildings, Kane said, for example a course that offers a sustainable builder advisory certificate. "It will give them a strong foundation in green building and it will give them credibility –that they have gone through a training," she said. "What I'm hoping is that we will continue to increase opportunities for green jobs and that other people will step up to the plate and provide training." More training is needed, admits Kimberly Schneider, Commissioner Sam Adams policy director for economic and workforce development. "We are talking a lot about how to get people into living wage jobs," she said. "We talk a lot about what is a self-sufficient wage and how do we get people living wages." Adams has been looking at how to finance a green job corp. that would train young people to work in areas such as stormwater management, environmental cleanup or landscaping. "The idea would be to create a youth job training program, that would serve youth from low income backgrounds or at-risk youth," Schneider said. "We're looking at different bodies and asking who has the experience to do this. Should it be the labor unions? Should it be Worksystems? (Worksystems Inc. runs workforce training programs.) Could we link up with Americorps?" Schneider expects a final plan early in 2008, she said. "We are really excited about it."